CU CHI - In a well-coordinated operation over a five-and-a-half day period, Wolfhounds of the 2d Battalion, 27th Infantry, repelled two VC-NVA night assaults and made several dramatic encounters killing 51 enemy. Early intelligence reports revealed large concentrations of enemy troops in the area. Early in the morning, the Wolfhounds moved into the area to establish laager positions and search out the enemy. Alerted by increased sightings and ambush patrol action, the soldiers of Alpha Company battened down their laager site some six miles south-southwest of Go Dau Ha shortly before the VC-NVA forces launched their first night assault. Alpha's first platoon spotted enemy movement outside the wire about 5 a.m. The men opened up with claymores, automatic weapons and mortar fire, blasting the enemy who had advanced to within 20 meters of the wire. "We could hear them screaming and yelling," reported platoon Sergeant Sam Spain. The company's Vietnamese interpreter stated that one of the enemy kept shouting, "Bring up the B-40, bring up the B-40." The battle lasted until the enemy retreated at first light. A sweep of the area the following day revealed 14 enemy bodies and numerous blood trails." Among the weapons captured were a Chicom light machine gun, four AK-47s, one B-40 rocket launcher and numerous documents. Throughout the following day the Wolfhounds swept the area for the enemy and further signs of activity. Then again on the night of the 27th, they dug in before the enemy struck the night location at 1:00 a.m. Private First Class Terry Rosebury of Walla Walla, Wash., recalled, "We first saw movement shortly after it got dark. Groups of five to ten NVA could be seen moving at different places 400 to 500 meters from the perimeter." Artillery called in on the enemy scattered the NVA but failed to drive them away. The 2d Brigade soldiers kept 100 per cent alert and called in more artillery on fresh sightings. "We kept hearing movement on our side of the perimeter," said 2d Platoon Leader First Lieutenant Robert Nebiker, of Maywood, N.J., "but couldn't see anything because of the tall plants." They soon found out how close the enemy was, however as two trip flares popped about forty meters from the perimeter. The Tropic Lightning troopers immediately engaged the enemy and found they were up against a large force as Charlie returned their fire. During this time, several NVA soldiers fought their way through the perimeter but were quickly killed by the Wolfhounds. Gunship teams and spooky arrived and added their firepower to that of the Fire Brigade soldiers and soon established fire superiority. Shortly thereafter the enemy withdrew leaving much equipment and many weapons. For two days following the final attack, the soldiers pursued enemy trails and signs of activity, engaging small forces and detaining several suspects before moving into another area. The Wolfhound body count added a considerable number to the 67 enemy killed within the 2d Brigade in the same period of time. 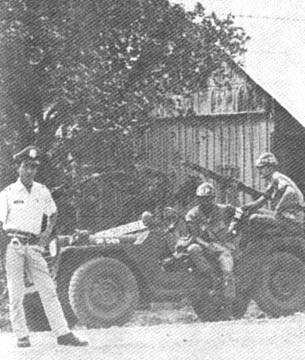 TAY NINH - The officers and men of Tropic Lightning's 3d Battalion, 22d Infantry, played host to a couple of Air Force officers from Guam at Fire Support Base Washington northwest of Tay Ninh. Captain George E. Upton of New Paltz, N.Y., a B-52 radar operator, and Captain Robert E Christensen, an aircraft commander, left their homes in the wild blue yonder to spend a few days with the foot soldiers. The two captains are members of a bomber crew selected to participate in an exchange program in which Army and Air Force officers switch places just to see what the other half is really like, and to understand each other's problems. 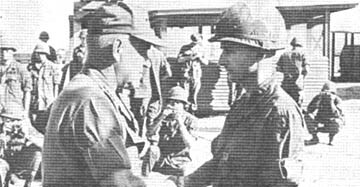 Upon their arrival in Tay Ninh both officers were greeted and briefed by Colonel Robert L. Fair of Alexandria, Va., the commanding officer of the 1st Brigade. They were then escorted to Fire Support Base Buell by Captain Larry D. Graves of Arvada Colo., the 1st Brigade's S-3 air officer. At Buell they met Lieutenant Colonel Alexander H. Hunt of Wealder, Tex., the commanding officer of the 3d Battalion, 22d Infantry. Taking off in Hunt's command and control helicopter, they watched while Company A of the 3d Battalion, 22d Infantry, was inserted into the jungles and rice paddies north of Tay Ninh. Landing at FSB Washington, the two airmen outfitted themselves with M16s, ammunition and canteens then joined Alpha as it made its second insertion into the jungle. 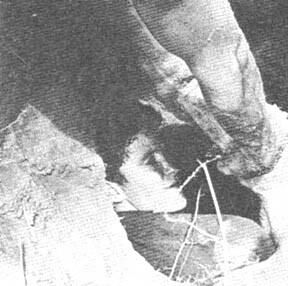 After being retrieved by Huey copters and dropped off outside the wire at FSB Washington, the Air Force officers made their way to Hunt's command tent. Soon Christensen, Hunt, Blackmon, and Upton were sitting around the command tent swapping stories. Much of the conversation centered around the new working relationship among the armed services. Soon it was dark enough for the artillerymen to start their harassment and interdiction fires. Captain Kenneth Coy of Eureka, Ill., commanding officer of A Battery, 7th Battalion 11th Artillery, showed the duo around his battery. Alpha's mortar crews were also starting their night's firing at intelligence targets, and took time to show the Air Force how to work the 81mm mortars. The two captains took turns dropping rounds down the mortar tubes. Later there was a demonstration of the protective fire that can be dished out around a Fire Support Base. Upton and Christensen took their places on the line firing M16s and an M60 machine gun. The following morning the two airmen left the 25th Division's operational area. Hunt presented each with a plaque as a remembrance of the visit with the Regulars. As they were leaving both emphasized that they better understood the infantry's role in the war. They only had one regret, and that was they didn't get to see a B-52 strike while they were flying around the area. "Perhaps we will next time around," said Upton. "Maybe we'll even get to go on ambush." A new program has been devised to help servicemen obtain valuable skills for use after separation from the service. Project Transition is a Department of Defense sponsored program to provide in-service training opportunities for separating personnel who have not acquired a civilian-related skill. Persons with up to six months remaining before their scheduled separation, and who are not going to re-enlist, can apply for a variety of special job-training or education courses. Army personnel who are scheduled for release from active duty under honorable conditions, either through retirement or completion of their term of service, are eligible to participate. Project Transition is offered at 55 different CONUS installations. Over 243 kinds of vocational courses are offered, ranging from Accounting to X-ray repair. You can apply prior to separation by completing a questionnaire upon which you indicate the career you wish to pursue and the training you desire. Project Transition is a CONUS program only. Take advantage of it. PFC James Burem, Co. B, 2d Bn., 14th Inf., a son. SP4 Murriel Lee Cook, Co. B, 36th Signal Bn., a daughter. The United States Army Chief of Staff has approved a program to promote recognition of Army members returning from Vietnam for reassignment or separation. In this regard the American Legion is considering a proposal to serve through its local posts as the point of contact for all local civic groups desiring information about returning Vietnam veterans. Under consideration is a post card form which would be completed during out processing from USARV and air-mailed to one of the state level American Legion organizations, which then would be referred to the local level. 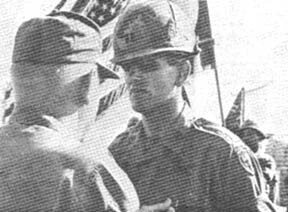 Added to the Tropic Lightning Combat Honor Roll this week is Corporal Charles W. Blixt who distinguished himself by heroic actions on October 3, 1968 while serving as a section chief with C Battery, 1st Battalion, 8th Artillery in the Republic of Vietnam. A numerically superior hostile force launched a massive mortar, rocket and ground assault against Fire Support Base Keene III. As the hostile projectiles impacted around his position, Corporal Blixt immediately observed the flashes from the enemy guns. With complete disregard for his own safety, Corporal Blixt exposed himself to a heavy volume of enemy fire as he moved about his section, organizing his men and preparing his howitzer for firing. 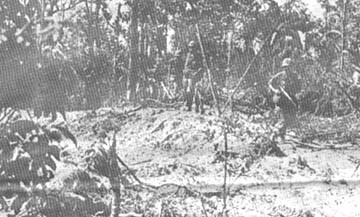 Corporal Blixt fearlessly exposed himself to the withering enemy fire as he assumed a position that enabled him to observe the insurgent's movements. Remaining at his unprotected position, Corporal Blixt adjusted his section's fire on the advancing enemy. His valorous actions contributed immeasurably to the success of the mission. In the course of the Vietnam war, distinguished combat leaders of all ranks have emerged. As a means of recognition for achievement and a source of qualified personnel to help end the serious shortage of Infantry lieutenants, the USARV Direct Commission Program has received special emphasis. The program capitalizes on the experience of non-commission officers and warrant officers, by permitting outstanding individuals to be appointed as second lieutenants. Thus junior officer vacancies are filled with combat tested personnel. The most important eligibility criterion for this program is an applicant's demonstration of outstanding leadership in a combat environment. The fact must be fully documented by the individual's immediate commander in order to qualify the applicant for consideration under the program. Other qualifications include; the individual having been assigned to this command for three months, recommended by company and battalion commander and be a high school graduate or school of comparable level, or pass the GED test (high school level or higher). He also must possess a minimum GT score of 110 and a minimum OCT score of 115, and be no more than 28 years old on the date of appointment. He must successfully pass an interview by a board of officers and attain a qualifying Officer Qualification Inventory (OQI-1) score. The applicant must be in the grade E-5 or higher with six months in grade and have applied for a commission in Armor, Artillery, Infantry, Corps of Engineers, Signal Corps or Transportation Corps. He must be a U.S. citizen or have lawfully entered the United States for permanent residence under the Immigration and Naturalization Act, and possess a favorable National Agency check at time of appointment. Commanders are urged to give the program personal attention and support to the end that no prospective individual is overlooked as directed by Lieutenant General Frank T. Mildren, deputy commanding general. TAY NINH - The Vietnamese Cross of Gallantry was presented by Tay Ninh Province Chief Colonel Nguyen Quang Thong to ten U.S. soldiers in a ceremony held at Tay Ninh Province Headquarters. Five of the recipients were from the 1st Brigade, and five were from MACV Advisory Team 90. The awards were presented as a result of action at Ben Cau, ten miles south of Tay Ninh City. During that action combined Regional Force, Popular Force and 1st Brigade troopers accounted for 96 enemy dead and numerous captured weapons. The five Lancer Brigade soldiers who received the Cross of Gallantry were Colonel Robert L. Fair of Alexandria, Va. commanding officer of the 1st Brigade, Lieutenant Colonel Alexander H. Hunt of Wealder, Tex., commanding officer of the 3d Battalion, 22d Infantry; Captain Donald I. Haramoto of Makawao, Maui, Hawaii, commanding officer of Charlie Company, 3d Battalion 22d Infantry; First Lieutenant Dale N. Richey of Fayetteville, N.C., commanding officer of Delta Company, 3d Battalion, 22d Infantry; and Captain Rex M. Stewart of Tacoma, Wash., U.S. Air Force Forward Air Controller attached to the 1st Brigade. The five members of the MACV Advisory Team 90 who received the Cross of Gallantry were Major Mowton L. Waring, Jr., of Ardsley-on-Hudson, N.Y., the team's S-3, Captain Richard H. Leach of Chelsea, Mass., Team Chief of Mobile Advisory Team 333; Captain Russel W Charlesworth, of Scranton, Pa., staff supply officer; First Lieutenant Richard K. Gooch of Henderson, N.C., Intelligence Advisor for Phu Khuong subsector; and Second Lieutenant Thomas J. Newman of Alliance, Neb., and intelligence officer under the S-2. COLONEL FAIR RECEIVES AWARD - Tay Ninh Province Chief Colonel Nguyen Quang Thong pins the Vietnamese Cross of Gallantry on the commanding officer of the 1st Brigade, Colonel Robert L Fair of Alexandria, Va, in recent ceremonies held at Tay Ninh Province Headquarters. The award was the result of the 1st Brigade's participation in heavy fighting around Ven Cau, ten miles south of Tay Ninh. STANDING PROUD are ten U.S. soldiers who were awarded the Cross of Gallantry. Five of the awardees are members of the 1st Brigade, and five are members of MACV Advisory Team 90. 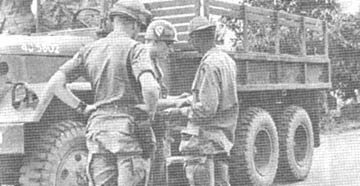 CU CHI - Two Michiganders, Sergeant Mark Shiemke and Specialist 4 David Herrmann, are currently serving with Headquarters Battery, 7th Battalion, 11th Artillery. The two met by coincidence last May in the midst of an enemy ground attack on their fire support base. Since there was a lack of infantry personnel, Shiemke, a radio operator and Specialist Herrmann, a wheeled vehicle mechanic, volunteered for temporary front line duty. Back in the world, Mark and Dave live less than four miles from each other. Shiemke is the son of Mr. and Mrs. Louis P. Shiemke, Detroit, and the husband of Mrs. Kathleen Jones Shiemke, Detroit. Herrmann is the son of Mr. and Mrs. Harry J. Herrmann, Warren, Mich. They agree that it is great to have a buddy from back home, but there is one drawback. One is constantly reminding the other of life back in Detroit, and this makes them both miss their home and families that much more. TAY NINH - While on a sweep 12 miles east of Tay Ninh City, Company B, 4th Battalion (Mechanized), 23d Infantry, found a large bunker complex with many military and non-military articles spread throughout. The number of bunkers, estimated to be more than forty, were all constructed with overhead cover. The strangest find made by the Tomahawks was an American-made typewriter. Near the typewriter were three cups of warm tea. Somebody left in a big hurry. Whoever it was left behind much that he didn't want to leave. In the same area one .45 caliber pistol was found along with an ammo box filled with military documents. Shirts, pants, wet weather gear, sandals, and eating utensils were found all over the area. Located about 70 meters to the west was a large covered hole that contained two five gallon tins of medical supplies and several ponchos. Assorted surgical instruments as well as pills and various types of bandage were in the tins. "This is one of the largest bunker complexes that we've come across. It's certainly the most productive one that we have found in a long time," said Tropic Lightning platoon leader, First Lieutenant Jackie G. Reamy, of Athol, Mass. CU CHI Following a day of heavy fighting, elements of the 4th Battalion, 9th Infantry under the operational control of the 2d Brigade, uncovered a significant cache of enemy supplies during operations five miles northwest of Cu Chi. 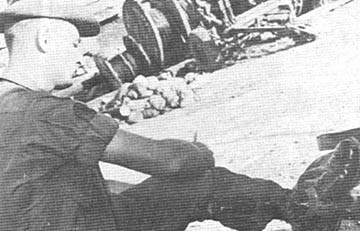 Charlie Company squad leader Specialist 4 Arnold R. Diekeme, Kent City, Michigan, first noticed fresh digging near an abandoned enemy bunker. An investigation by Manchu soldiers revealed a tunnel containing 76 Chicom bangalore torpedoes, 1,500 rounds of .51 caliber machine gun ammo, 15 82mm mortars and fuses. CU CHI - From more than a dozen fire support bases strung from Cu Chi to the Cambodian border, Tropic Lightning's interlocking fires relentlessly pound the jungle-shielded insurgents. But any fire is valueless unless it can be applied quickly, anywhere over the large area of operations of the Division. Calls for support from field units must be communicated to fire support bases and base camps, and target coordinates must be given; Tropic Lightning cannot strike blindly. Linking all these posts is the communications net of the 125th Signal Battalion, a unit organic to the division. Through this net passes not only tactical information and requests but also messages dealing with supply, personnel, the processing of orders and all the many aspects of military housekeeping for a division in combat. The Hawaiian inscription of the 125th Signal Battalion, "Leokani Okauwila," means "Voice of Lightning." And being the voice of Lightning, the 125th has a mission of many phases to perform. It provides multi-channel voice and teletype communications among all echelons of headquarters and major subordinate units. A three-man telephone switchboard, Tropic Lightning Main handles more than 130,000 calls a month. Switchboard workers stand two hours on and two hours off during their duty day. About 20 major signal MOSs (military occupation specialties) are represented in the 125th Signal Battalion, and training in school courses for the men of the 125th ranges from eight weeks for linemen and operators to 40 weeks for those who will work in top-secret, crytographic MOSs. In addition to its electronic communications net, the 125th with about 650 officers and men, maintains the motor messenger service for the Division and supplies photographic support for the Division's activities. I.D. card pictures are probably the most familiar product of the photographic lab. One of the most crucia1 and scenic points in the communications net is the 125th Signal relay station on Nui Ba Den Mountain. Accessible only by helicopter, weather permitting the station on Nui Ba Den picks up and relays UHF and VHF signals. When communications channels must skip over contested territory, radio communications are in order. In common use is a 12-channel set, each channel of which can be connected to a telephone or teletype circuit. The 125th Signal Battalion has its own maintenance shop for the machines of the Tropic Lightning communications net. The shop performs routine maintenance and replaces parts. The motto "Voice of Lightning" is but a clue to all missions and functions of the 125th Signal Battalion. The 125th is the nervous system of a fighting division carrying messages to all of its elements - and all of the news is bad for Charlie. But of course there is a voice of lightning too. Doubters may be persuaded by dialing 'Operator' on any Tropic Lightning telephone. HATS TELL THE STORY as the 1st Air Cav MPs and division MPs carry on joint operations in Tay Ninh Province. A COMBINED EFFORT - MPs of the 25th and 545th MP companies participate in resource patrols with the National Police throughout Tay Ninh Province. 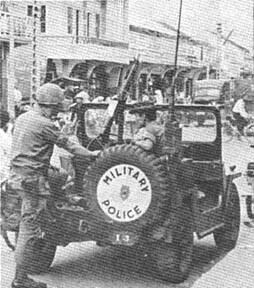 "We provide security for the National Police and help with the searching of vehicles when they request us to," said Specialist 4 John W. Robinson of Cleveland, Ohio (seated). Also pictured is Specialist 4 William E. Wright of Charleston, W. Va., behind the M-60. 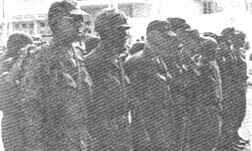 TAY NINH - The 1st Platoon of the 25th MP Company assigned to the 1st Brigade, Base Camp at Tay Ninh West has been joined in its operations by the 1st platoon of the 545th MP Company assigned to the 1st Brigade of the 1st Air Cavalry Division. The joint operations came as a result of the 1st Cav's recent insertion into War Zone C, with its 1st Brigade having its headquarters at Tay Ninh West. The 1st Cav's 1st Brigade moved into camp in late October, 1968, and the two platoon leaders, First Lieutenant Morris W. Sills of Oreland, Pa., of the 25th and First Lieutenant John Smith of Dallas, Tex., of the 545th immediately joined forces to more effectively cover Tay Ninh City and Tay Ninh Province. On Post Patrol, gate activities, PX guards and other posts of mutual interest there is both a 25th and a 545th military policeman. Because of the joint operations, an additional town patrol has been added. Each town patrol consists of a 25th MP, a National Policeman and an interpreter. Tay Ninh City is off limits to military personnel. However black market activity, off limits violators, and the MSR from Cu Chi, Long Binh and Saigon to Tay Ninh West Base Camp give the town patrols more than enough work. The 545th shares the facilities of the 25th, with the platoon leaders maintaining a joint office. Sills of the 25th is the Tay Ninh West Base Camp provost marshal and Smith of the 545th is the assistant provost marshal. A joint blotter is maintained with information copies sent to the commanding officer of the 1st Brigades of both divisions. The two platoons eat in the same mess hall, sleep in the same hootches, and operate a club together for the use of the MPs only. "We're awfully glad to have the 545th here," said Sills," to allow us to give the coverage to our area that it needs." Smith, when asked, replied, "The 25th has one of the most professional operations I have ever seen and I'm very pleased that we (the 545th) have the opportunity to work with them." TAY NINH - It is a far cry from the ice-packed mountain peaks of San Moritz, Switzerland, to the rice paddies of South Vietnam and a hard transition for anyone to make But Sergeant Erich Morris of the 3d Battalion, 22d Infantry, has made the switch in grand style. The change in scenery was quite apparent last August as Morris crawled forward through the defensive wire at Fire Support Base Buell to rescue three members of his squad wounded while manning a listening post. Even though he exposed himself to a heavy volume of enemy fire, Morris saved his men and received a Bronze Star for his gallantry in action. Born in Switzerland and educated in Germany, Erich moved to California about five years ago accepting an opportunity to study in the United States as an exchange student. Attending UCLA and later San Francisco State University, he received his bachelor's degree, and had planned to attend the University of Heidelberg Medical School when the United States Army entered the picture. Actually, I had become a citizen of the United States before I received my draft notice," said Morris. "It did come as somewhat of a shock, though because I had just received my letter of acceptance from the University." In just a few short months Morris was graduated from the NCO academy at Ft. Benning, Ga., and then to Ft. Polk, La. for on-the-job training and then to the 25th Infantry Division in Vietnam. Arriving at the 3d Battalion, 22d Infantry, he immediately took up his post as squad leader. In addition to earning the Bronze Star, Erich received an Army Commendation Medal for helping to ward off another abortive VC attempt to overrun his position at Fire Support Base Buell. Erich leaves the service when he returns from Vietnam and will join his wife Pam, also a former exchange student, in Salinas, Calif.
Morris has expressed on several occasions his feelings about serving in the Army of the United States and has stressed the fact that he is very proud to wear the uniform. "Pam and I are glad to do our part to serve our new country." TAY NINH - In a recent ceremony held at Tay Ninh Province Headquarters, the Bronze Star medal was presented to four Vietnamese soldiers by Major General Ellis W. Williamson, commanding general of the 25th Infantry Division. The awards were presented as a result of action at Ben Cau ten miles south of Tay Ninh City. During that action, the Regional and Popular Force soldiers accounted for a 90 VC/NVA body count and captured numerous weapons. They were joined in the action by elements of the 1st Brigade. General Williamson presented the awards to Captain Nguyen An Ninh of the 146th RF Company, First Lieutenant Le Ngoc of the 688th RF Company, Second Lieutenant Cong Loung Le of the 688th RF Company and Second Lieutenant Doan Van Lang of the 251st Artillery Battalion (ARVN). At the ceremony Colonel Robert L. Fair of Alexandria, Va., commanding officer of the 1st Brigade, made members of 164th and 688th Regional Forces companies honorary members of the 1st (Lancer) Brigade. The new Lancers were presented with pins bearing the 25th Infantry Division's Insignia. CU CHI - Golden Dragons from the 2d Battalion, 14th Infantry, recently made a heliborne assault of suspected enemy positions near the Oriental River, continuing their purge of enemy concentrations in the Duc Hoa area. 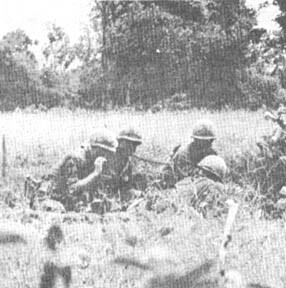 Elements of the 2d and 3d platoons of Bravo Company were the first to make contact as pointman Private First Class Alan W. Garrison spotted movement in a hedgerow to his right flank. "I fired my M-79 into the thicket, and as I did an NVA with a loaded RPG exposed himself," reported Garrison of Morgantown, N.C. "Before I had a chance to reload, Private First Class James D. Munn, our machine gunner, shot by me like a rocket, his sixty blasting away and cut him down," Garrison continued. Action continued as flanker Private First Class James E. Snook, Sacramento, Calif., approached a bunker while the battalion's Kit Carson scout, Van Chung Phan covered him. "As he pulled off the overhead cover an NVA in new web gear popped up and fired, wounding him," First Lieutenant Edward Morrow, Minneapolis, Minn. said. "While the NVA was still firing, Chung and Private First Class James M. Raves charged his position and the rest of the platoon moved up to help Snook." A sweep of the immediate area indicated that three of the enemy had been killed and one wounded. The Tropic Lightning soldiers captured one RPG-7 launcher and two RPG-7 rounds, and five individual weapons. DAU TIENG - Air strikes and artillery nailed half a dozen enemy soldiers after they fired on an Air Force spotter plane near Dau Tieng. The pilot of the aircraft, an O-1 Bird Dog, was circling above an enemy trail winding through elephant grass west of the Michelin rubber plantation. Just as Captain James J. Hourin of Ellenville, N.Y., thought he spotted an enemy below, ground fire from enemy rifles and machineguns came whizzing past the plane. 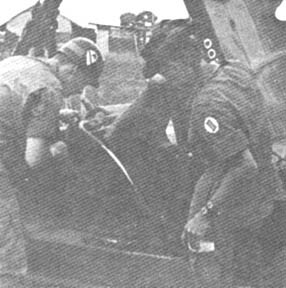 Hourin called in air strikes from Tuy Hoa and Phan Rang as guns of Alpha Battery, 1st Battalion, 27th Artillery began pouring 155mm howitzer rounds on the suspected position from the base camp of the 3d Brigade at Dau Tieng. After the smoke cleared Hourin flew back in and spotted six enemy bodies below. TAY NINH - Creating jobs in South Vietnam is a problem confronted by most province officials. The Labor Office in Tay Ninh recently came up with an idea to help solve their problem. By using a waste product of war, jobs could be created, and the poor people of Hiep-Anh hamlet would gain useful household appliances. During early November, 1968, Vo Van Sua and Le Thanh Cuu of the Tay Ninh Labor Office requested from the civil affairs officer of the 1st Brigade, damaged 175mm powder canisters. "I was a little apprehensive at first, knowing that a metal canister can be made into weapons of war. I was curious as to how they could be made into implements of peace," stated Major Clarence De Young from San Diego, Calif., 1st Brigade civil affairs officer. 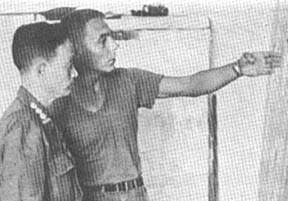 Vo Van Sua then proceeded to explain to De Young the objectives of his request by showing him a stove he made from a 175mm canister in early 1967. Sua then demonstrated how one canister can be cut into two pieces, creating a base and a top for a useful Vietnamese stove. The stove will be used for household cooking. The excess metal could be used for drain pipes, construction pillars or metal sheeting. Sua stated that he could hire 20 Vietnamese laborers through the Labor Office and pay them with profits from the sale of the stoves on the open market. Each stove will sell for 400 piasters ($3.40). The 400 piasters will not only cover the laborers' wages but pay for paint and the wick-filter mechanism that each stove requires. The wick-filter mechanism has to be purchased on the local economy. Many of the stoves will also be given to the poor of Hiep-Anh hamlet. "Their request showed much planning and ingenuity," commented De Young. "The important thing was that they were helping themselves. All they needed from us were the canisters. I was all for it." Permission to give damaged canisters for this special purpose project was granted by USARV Headquarters in late November, and in early December 1,343 damaged canisters wore picked up by Tay Ninh Labor Office officials. Of the 1343 stoves made, approximately 800 stoves will be given to the poor of Hiep-Anh hamlet. The other 543 will be sold to cover workers' wages and material costs. "In the near future we plan to teach other villages throughout Tay Ninh Province the method of converting damaged canisters into stoves," said De Young. 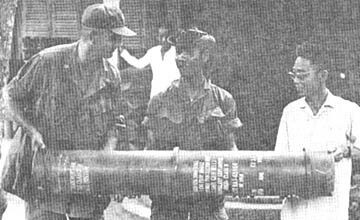 TOMORROW A STOVE - One of the 1,343 canisters donated to the Tay Ninh Labor Office, is handed to Pham Quoc Ninh (right), chief of Tay Ninh Labor Office, by Major Clarence De Young of San Diego, Calif., civil affairs officer for the 1st Brigade. 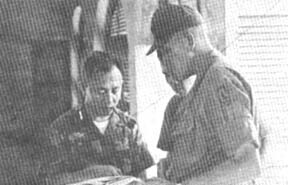 Sergeant First Class Vo Vihn Luu (center), a Vietnamese interpreter for the 1st Brigade translates. 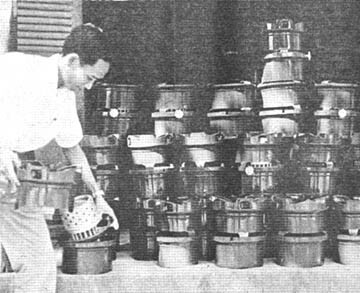 Each canister is converted into one stove which used any combustible liquid. Creation of jobs and stoves for the poor are the Labor Office objectives. THIS YOUNG WORKER methodically hammers the cut out portion of the stove's top, thus molding the legs and grill work. LE DINH CUU, who is part of the Labor Office, spray paints part of the finished product using a home made spray gun. 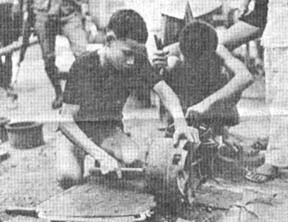 Pressure is created in the bicycle's innertube by two young Vietnamese boys using air pumps, thus creating enough pressure to operate the spray gun. READY FOR MARKET - Le Dinh Cuu installs the wick mechanism into the base of the stove. Each stove will sell for 400 piasters ($3.40), which will cover the cost of the wick mechanism, labor and paint. TAY NINH - Complete coordination, communications and understanding between the U.S. and ARVN forces - that's what has been effected through a forward Tactical Operations Center (TOC) in the division's northern area of operations. 'Division Forward' is the tag given to the system at Tay Ninh East that coordinates Division plans and operations with ARVN airborne units and ARVN Special Forces. According to Captain Charles E. Mehring, of Lawton, Okla., assistant operations officer, "Division Forward provides the field commander, that is, the assistant commander of maneuvers, Brigadier General Glen C. Long, a forwardmost post near the action." Mehring described it as an extension of Division Headquarters, referring to the Tay Ninh City TOC as a 'field headquarters' for General Long. By having a communications center within an ARVN compound, Mehring said it is "possible for us to relay any and all intelligence and operational information to the division main," thereby providing immediate knowledge to decision makers at division level. Sergeant Donald A. Bosworth, of Pasadena, Calif., added that Division Forward aids in the support of ARVN units in the Division's area of operations, and that a more effective liaison between U.S. and ARVN troops is accomplished. The idea for a forward TOC materialized during the Battle of Tay Ninh in mid-September last year, when enemy troops had the intention of capturing and holding Tay Ninh City. "They failed miserably," the Captain said tersely. ''Our success," explained Captain Ray Kirkpatrick, communications officer from Newark, Del., "is contingent on our complete communications system to all units and brigades." 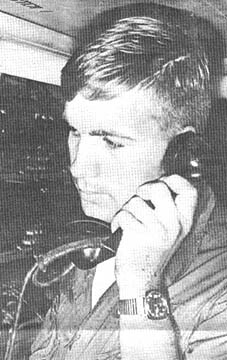 Kirkpatrick mentioned Division Forward implements a system of telephone, radio and land lines to maintain direct contact with the brigades of the division, the 1st Air Cavalry Division, and ARVN Special Forces and Airborne units in the field. 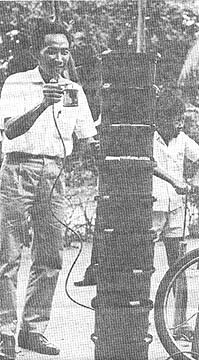 Secure radios used to discuss classified information are set up at Division TOC in Cu Chi base camp and Tay Ninh East. 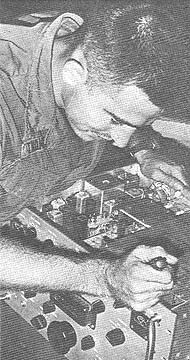 The radio system also forms a communications net for the liaison officer at the 1st ARVN Airborne Brigade. Nui Ba Den, the lone, huge mountain jutting from the flat land in Tropic Lightning's area of operations north of Tay Ninh is a valuable and essential communications link, according to Kirkpatrick. He said all communications from the area to Division headquarters depend on the mountain. Sergeant Jerome Pellerin, of Bennington, Vt., communications NCO, noted that the entire TOC, complete with all equipment could be totally dismantled, transported to another location, and set up again in three to five hours. He emphasized the mobility of the entire Division Forward operation. A typical day's work, according to Mehring, includes "first and foremost, security of all roads in the division's area." It is the responsibility of the forward TOC to keep maps and charts current on progress of mine sweeps. Any significant finds or presence of enemy is related immediately to Division level, so action can be taken. "We also coordinate extensive heliborne operations combined with ARVN forces within the Division," explained Mehring. On one particular day, the Division Forward TOC was instrumental in having one ARVN and two U.S. companies airlifted into enemy territory in War Zone C. Their purpose was to frustrate VC and NVA attempts at establishing base camps and resupply points in that area. Communications is important in coordinating combined efforts with ARVN units in heavily populated areas. "Our purpose is to help the Vietnamese people through civil affairs and psychological operations and medical-civic actions programs," noted Mehring, "and we're helping them help themselves through better coordination." Also there is daily liaison with ARVN Special Forces Headquarters in Tay Ninh East, where there is a mutual exchange of valuable tactical information. Each day Tay Ninh province chief Colonel Nguyen Quang Thong is briefed on the day's operations. "This helps immensely in coordinating U.S. and ARVN forces in the field," said Mehring moments after he had briefed the province chief. Major Aubrey J. Holloway, assistant operations officer in the Division TOC at Cu Chi Headquarters, explained that the Tay Ninh TOC's primary function is to keep up-to-the-minute track of ARVNs, Special Forces and 1st Air Cavalry forces which border the division's area. Looking at the operation from the division point of view, Holloway, a native of Atlanta, gave an example. "Say the ARVNs decide they want to put a 250-man force into our area of operation. They would first check with Tay Ninh's Division Forward, which would then check with us. This way we know exactly where everyone is, and avoid duplication of effort and mixups in the field." If a tactical maneuver originates with Division Headquarters, the information goes immediately to Tay Ninh, is mapped, and all concerned units are notified. Holloway said, "This co-location with ARVNs and the eye-ball-to-eyeball contact is unbeatable." He concluded that now there is an "untold improvement in the smoothness of the U.S. and ARVN combined operations in the division." PROVINCE CHIEF BRIEFED - Captain Charles E. Mehring of Lawton, Okla., assistant operations officer of division Forward briefs Colonel Nguyen Quang Thong, Tay Ninh's Province chief, on military operations in the Tropic Lightning's AO. 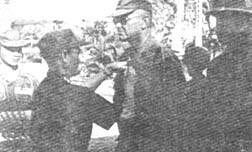 Lieutenant General Do Cao Tri, commanding general of III Corps Headquarters, points out to Brigadier General Glen C. Long, assistant division commander for maneuver, where one ARVN battalion is located. Major General Nguyen Xuan Thinh, commanding general of the 25th ARVN Division, looks on. Captain Robert A. Snyder of the 7th Battalion, 11th Artillery and Captain Gerald J. White of the 3d Battalion, 22d Infantry, have been awarded the Distinguished Service Cross for valor. While CPT Snyder was serving as Battery Commander, the enemy attacked Fire Support Base Buell II. Though wounded, he led and encouraged his men. CPT White was serving as Company Commander of D Company, when the enemy attacked his perimeter. He organized his wounded into a reactionary force, and repelled the enemy.